There is also a strong case for Ofsted undertaking a thematic review of exclusions which I will touch on at the end of this post. 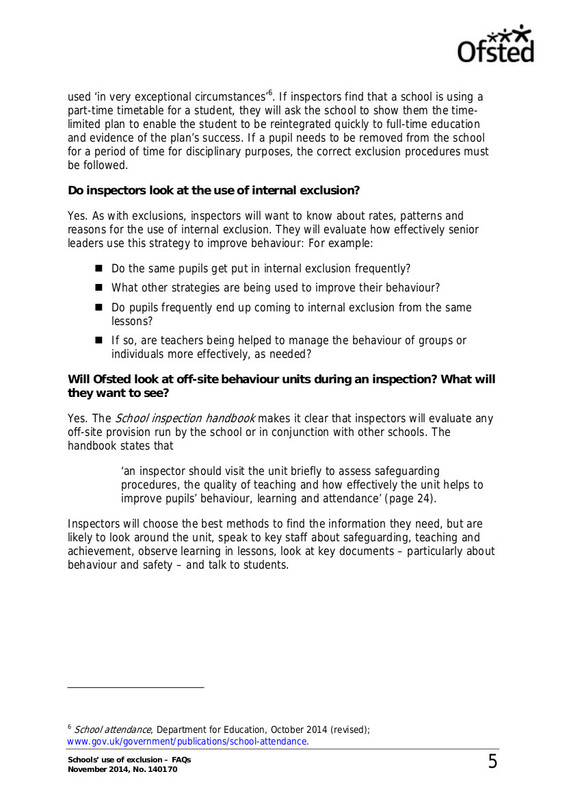 Section 5 inspections are definitely a way to get Ofsted looking at exclusion practice. This means Ofsted could – if it chose – track what happened to a particular pupil before removal from roll, including where parents felt they had no choice but to home educate. It also means Ofsted could track the experience of a pupil who was being continually “parked” or spending the majority of time in internal exclusion, as I wrote about here. The Ofsted FAQ on Exclusions from November 2014 is still linked as current from the “Ofsted Collections” page despite frequent reference to the January 2015 Handbook which has now been superseded. A further catch is that Ofsted might not get round to looking at the school very often, particularly if the last inspection was good. In addition, outstanding schools are exempt. However, Ofsted uses a statistical methodology to assess the risk of good and outstanding providers declining since their last inspection, and the latest Methodology Note (Ofsted July 2015) has more information about the Risk Flags. Exclusion is mentioned, as are “qualifying complaints” from parents. The methodology note says that from 1 September 2015, risk assessment will be used to assist in prioritising short inspections [ie section 8, see below] for good schools, and to identify any exempt (outstanding) primary and secondary schools of concern. The School Improvement Inspection Handbook doesn’t specifically mention exclusions but several school improvement reports do have something critical to say on the subject. the local authority does not forensically analyse attendance and exclusion data to identify trends that need to be addressed. For instance, a rising trend in fixed-term exclusions for primary-aged pupils has not been identified or addressed. The local authority’s work with academies may come under scrutiny in Ofsted’s school improvement inspection, even though LAs have no direct powers of intervention with academies. Local authorities are responsible for those children and young people (under age 25) in its area who have, or may have, special educational needs (SEN) These SEN duties apply regardless of where the child is educated. • Local authorities have overarching duties under the Children Act 1989 in respect of the safeguarding of children in need, or those suffering or at risk of suffering significant harm, regardless of where those individual children are educated or found. To comply with these duties, local authorities may need to work with maintained schools, academy trusts or independent schools (wherever the individual child concerned is educated) to investigate what action they need to take to safeguard such a child. The limitation on school improvement inspections as a driver for change with regard to exclusions is that Ofsted will only go in to a council where concerns about performance are apparent or where requested to do so by the Secretary of State. In theory, the safeguarding inspections of children’s services could be used to look at school exclusions but in practice the scope for this is somewhat limited, especially for internal exclusion where a child will be regarded as “safe” if he or she is on school premises during school hours. In 2013 Ofsted looked into children missing out on education, and as a result, inspectors now ask for “detailed and specific data on school-age children, for whom the authority is responsible but who are not in full-time education” as part of the inspections of local authority children’s social care. The new Inspection Framework (September 2015) reiterates that Ofsted will track and sample the individual experiences of children and young people, including those missing from education or being offered alternative provision. Unfortunately, parents will probably not be aware that Ofsted is in their area and wouldn’t have a way to contact the inspectorate anyway, so it will depend to a great extent on how the inspection team defines “missing from education” given that inspectors are increasingly hyperfocused on children out of school who might be in danger of sexual exploitation. The thing Ofsted is picking up on now is children who miss out on educational entitlement. By its own criteria then, Ofsted should be taking a hard look at internal exclusion and what actually happens to pupils who are repeatedly parked out of lessons or sent to an on-site unit. The school might be able to justify this on behavioural grounds but if there isn’t a proper plan for the child’s education during internal exclusion or if reintegration does not provide an opportunity for the pupil to catch up on any work missed, the school should be held to account for the effect on the child’s education. Parents sometimes say to me that their child has missed so much that there’s no chance they’ll pass exams if they stay in school anyway. This is where it shades into illegal exclusion or offrolling where parents feel they have no choice but to take the child out and home educate. For their part, parents need to log what is happening at school, to see whether the school just keeps doing the same thing over and over. As I said in my post last week, by the time it gets to a fixed period exclusion, there will likely already have been a lot going on behind the scenes that parents might not necessarily be aware of. Parents can ask for a copy of the school’s Behaviour Policy and a written explanation of different types of adjustment for example when the child is sent to a different classroom. Furthermore, if the parent believes the child’s SEN makes it more difficult to comply with certain rules, he or she can formally request an adjustment such as a safe place for the young person to go so they aren’t just leaving the classroom without permission for an unknown destination, which would otherwise trigger a sanction. The local authority SEN department also has a legal responsibility here, and the fact that it may have very little power over the school doesn’t change that. There is a strong case for Ofsted undertaking a thematic review of school’s internal and external exclusions as a follow-up to the 2014 Below the radar: low-level disruption in classrooms where the over-riding message was mostly about “tightening-up” and “setting clear expectations” with no consideration whatsoever of special educational needs. The latest exclusion statistics reveal that of the 142,850 pupils subject to fixed period exclusions, 10% had a statement of SEN (rising to 13% in primaries) and 75,080/142,850 (53%) of pupils receiving fixed period exclusions had some form of SEN (rising to 76% 16420/21650 in primaries). Nearly half (46%) of pupils subject to fixed period exclusions in secondary schools had special educational needs (53,190/115,670). This entry was posted in Uncategorized and tagged academies, behaviour, behavour policy, children missing out on education, Children's Commissioner, exclusion, exclusions, framework, handbook, inspection, Internal Exclusion, offrolling, Ofsted, Persistent Disruptive Behaviour, Qualifying Complaints, school improvement, section 5, section 8, SEN on September 7, 2015 by Fiona Nicholson.